ESA has signed a 41.3 million euros contract with Inmarsat to help get more flights in the air with fewer delays, increased safety and reduced carbon dioxide emissions. Iris, element 10 of the ARTES program, aims to develop a new air-ground communication system for air traffic management. It is the satellite-based solution for the Single European Sky ATM Research (SESAR) program. By 2020 it will contribute to the modernization of air traffic management by providing digital data links to cockpit crews in continental and oceanic airspace. Image is courtesy of ESA-P. Carril. The program will introduce a safe and secure satellite-based air traffic management data link between aircraft and air traffic control (ATC) to relieve the congested radio frequencies used today. The contract was signed this month during a ceremony in London. ESA, Inmarsat (GB), Thales Alenia Space (IT), CGI (GB) and an industrial consortium will now start finalizing the technology and preparing the implementation across Europe. Iris supports the Single European Sky ATM Research (SESAR) master plan for the next-generation of air traffic management. SESAR provides recommendations on how to deliver security, capacity, safety and efficiency benefits for European air traffic. This is crucial, as the number of flights in European skies is expected to grow by 50 percent over the next 20 years. Satellite data links between aircraft and ATC are currently mainly used as support over oceanic airspace. The already-congested European continent still relies on radar- and radio-based ATM systems, which require aircraft to be separated by a certain distance or time to ensure safety. Poor weather conditions can also hamper pilots’ and ATC’s ability to navigate the skies safely, and necessitate even larger gaps between flight paths. These limitations have brought Europe’s airspace to near-saturation, resulting in mass flight delays and cancellations and wasting untold amounts of time and money. As European skies become busier, the terrestrial data link systems will reach full capacity by 2025 to 2030, which is why SESAR has recognized the need for a complementary technology solution. ESA and Inmarsat have been testing and developing the Iris ground network and cockpit terminals that will help to do just that. Iris technology will relay vital aircraft information and safety services to air traffic control using satellites, creating a secure SATCOM-based solution that will relieve pressure on existing data link communications. Controller-pilot communications will increasingly move to digital text instead of voice, improving speed and accuracy. 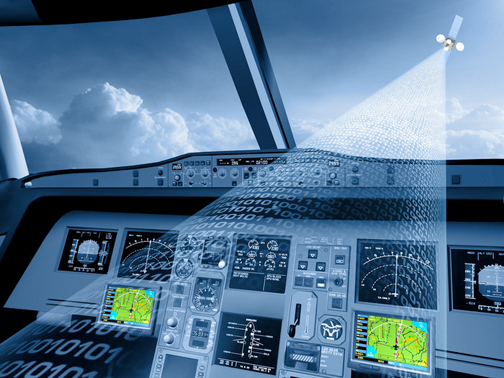 Iris is also designed to enable initial ‘4D’ trajectories, pinpointing an aircraft in four dimensions: latitude, longitude, altitude and time, which is one of the major concepts defined in SESAR. This will enable precise tracking of flights and more efficient management of traffic through Trajectory-based Operations (TBO). TBO allows pilots and controllers to collaborate on flight trajectories and calculate the shortest available routes, cruise at optimum altitudes, and use continuous climb and descent paths, saving fuel and improving the environment. Iris will also define how modernization programs can evolve to enable full 4D trajectory management over airspaces across the globe, with satellite data link becoming a primary means of secure communications between controllers and aircraft. Magali Vaissiere, ESA’s Director of Telecommunications and Integrated Applications, said it is hard to overstate the impact this new application of satellite technology will have on modern air travel. The company has been working on the Iris program with Inmarsat and additional partners since 2012, and are now able to implement the result of this extensive research and development to improve the European economy and the lives of European citizens in this very tangible way.